People have used mesh networks to accomplish all kinds of elaborate things — create connectivity in rural areas, create ad hoc file distribution networks, or even just rig up unofficial municipal Wi-Fi. One of the problems with Wi-Fi is its inherently poor signal strength to the places in your home you want to actually use it. Sometimes this is a problem of placement, accommodating construction in your home, or the way Wi-Fi signal bounces and reflects off internal walls, causing areas of poor reception. Sometimes it's a problem with your equipment, like the poor antenna design in the Titanium PowerBook G4 from so many years ago. Because Wi-Fi is a technology that requires both transmission and reception (Rx and Tx) to be strong, both antennae have to be optimally designed, and given power within the FCC limits, while still functioning. In the old days of Wi-Fi, there were several tricks people would do — putting on bigger, stronger gain antennae (7dbi instead of the stock 3dbi) or loading special drivers that allowed you to increase the power to the antennae on the client computer (something we used to do back in the Mac OS 9 and OS X 10.0 days), or special router firmwares that allowed increasing power to the antennae in the firmware. In years past, we'd also use devices like range extenders, or attempt to bridge routers to extend range, with mixed to poor results. A simple two-port switch, and USB you can't use. And all that's fine, but it doesn't really help you understand how to solve the problem of dead zones of Wi-Fi in your home or apartment. The first thing to know is that Apple provides you with a quick way to tell what your signal strength really is. The four bars of signal in the Wi-Fi / Airport indicator aren't very helpful — they switch over at intervals that may or may not map to these numbers, but it means that most of the time, you're likely to see all four bars filled in. Notice under Eero 2 that the upstairs bedrooms have low signal strength - but I'm literally 10 feet from the router. It's a mystery. I extensively tested every corner of my house and common seating areas, and found that pretty much every area in the two story, 1800 square-foot house, built in 1981 (wood frame construction, drywall wall construction — not 1890s lathe and plaster, not modern metal stud construction) I have high quality signal. There are places in the house where it is certainly weaker, but if I had not measured, I would have thought that one of the best areas in the house was one of the worst, just on a feeling. I had tried to remedy it in the past with an Airport Express set to extend the main router, and for one, it never worked very well in that room, and two, it appears to have not been necessary. (It could have been at the time. The main router has changed a few times since then.) Well, modify that: With one main router, it isn't necessary, and the signal is great. With two Eeros, the second one placed to rectify weak signal in the upstairs furthest from the main router, signal in the room above the main router dropped precipitously. Testing was done like this: I measured without any Eero installed, then installed one Eero, measured again, and then installed the second one to measure a third time. For the size of home we have here, it doesn't make sense to install the third unit, and testing showed it would not have been needed. It's important to note that wireless signals propagate downward - if it were possible, it would be best to have the main router on an upper floor, and have it bathe the lower floors in signal. That's frequently not possible: when an internet service provider comes to do a job, they come and do things in the way that will optimize install time for them. So how do I explain the numbers dropping even though I'm staring right at the upstairs Eero? I don't. Wi-Fi, and all wireless, is a difficult science, and I have great respect for wireless engineers. 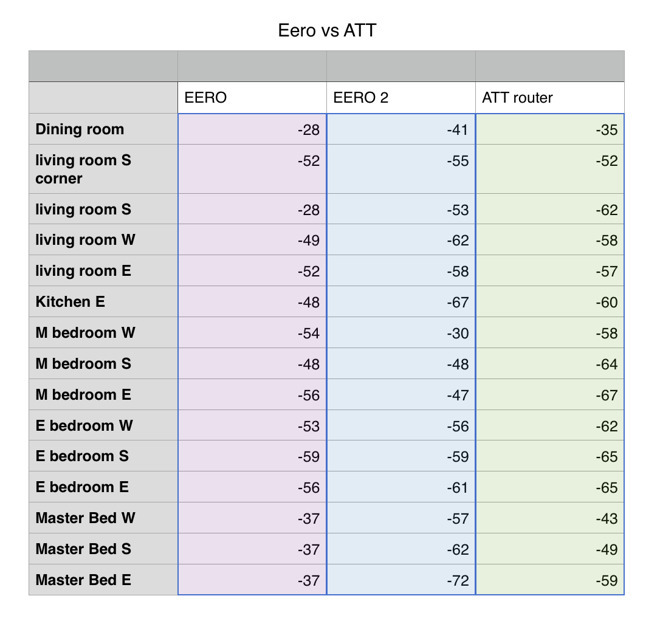 When I measured using the single Eero, I had numbers in the -50s. When I measure and am across the room from the second Eero, numbers are now high -60s to low -70s. And yet, file transfers on the lan seem fast, and devices aren't having a lot of trouble, so it's still within the medium to high quality range. If that sounds somewhat inconclusive and frustrating to explain, it is. On the upside, the app and setup are nice and easy to navigate. My experience wasn't the worst reported. 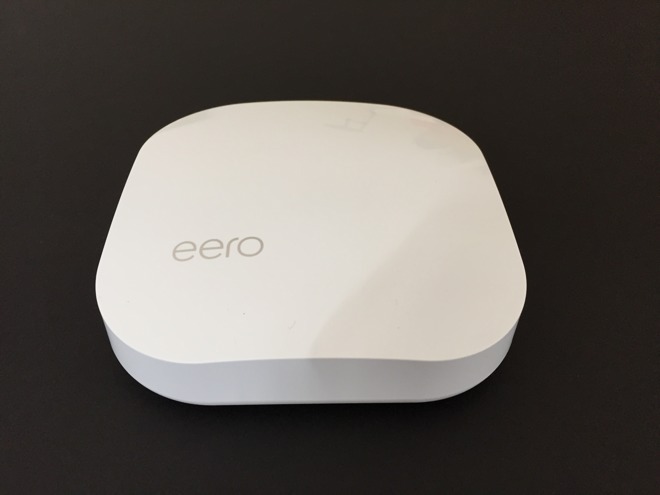 A friend also has Eero, and noted that if one drops, you can't reset it without unplugging it, and if you need to reset your whole network, you have to go and unplug the main unit. In his experience, the units would drop off the network without any apparent reason. My experience wasn't quite that bad, but it wasn't encouraging seeing numbers get worse, rather than better. Setup is pretty simple. 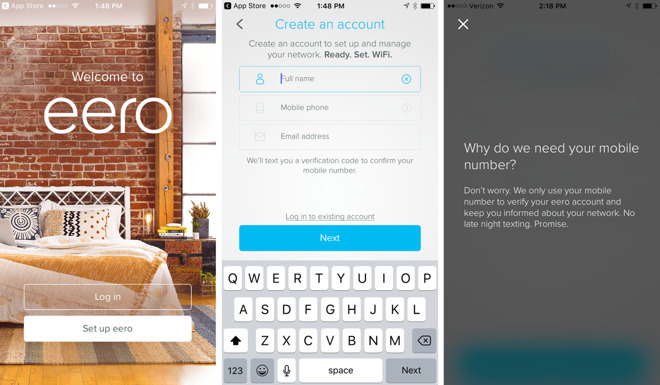 After launching the app, you're asked to register, and provide your phone number. This sends an activation code to your Messages, which you then input into the app. It's a little disconcerting to require a phone number to setup a Wi-Fi router, but if it enables managing the router remotely, it's the least impactful way of doing it. Then the app shows the steps required to set up the router - it's pretty simple. The app takes care of it all, including getting the connection, setting up the Internet, updating its firmware, and so on. It's all very painless. From this standpoint, the Eero system is Apple-like. The units have a slight curve that crests in the middle of their top surface, and the only markings on their tops are the "eero" name, rendered in metallic leaf print. It's not bad, and far friendlier than something with multiple antennae sticking out. These are the sort of wireless units you could put on a credenza and not feel entirely out of place. 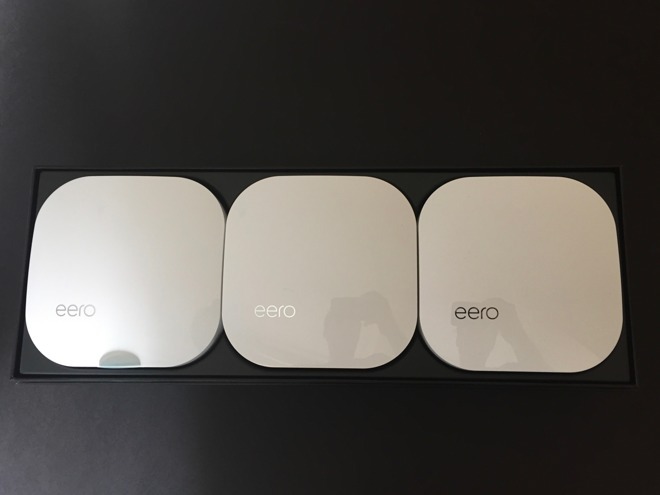 Adding the second Eero to the one unit setup was equally easy. I plugged in the additional unit, waited for its light to turn blue, and went through about 3 steps in the iOS application. The app found the new Eero, joined it to the existing network, updated its firmware, and that was it. Elaborate things like port forwarding aren't hard, either. 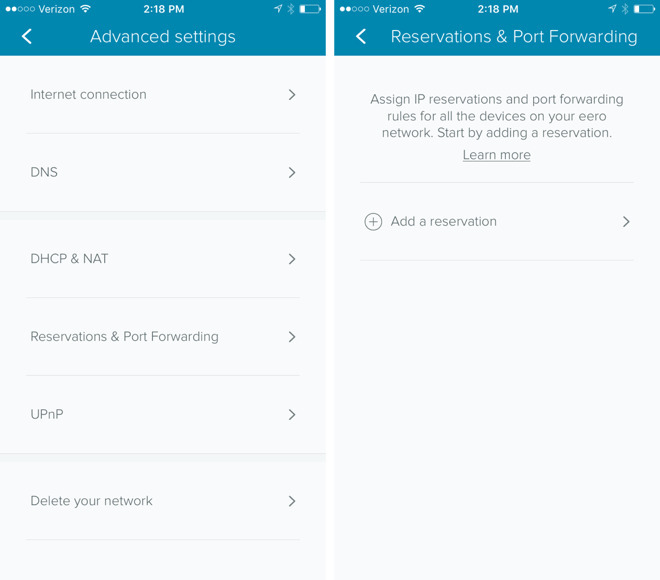 You choose a device on the network, reserve an IP to it, and then open a port. It's a few taps on the app, but all simple to step through. I would have no trouble guiding someone to do it over the phone without the app in front of me. 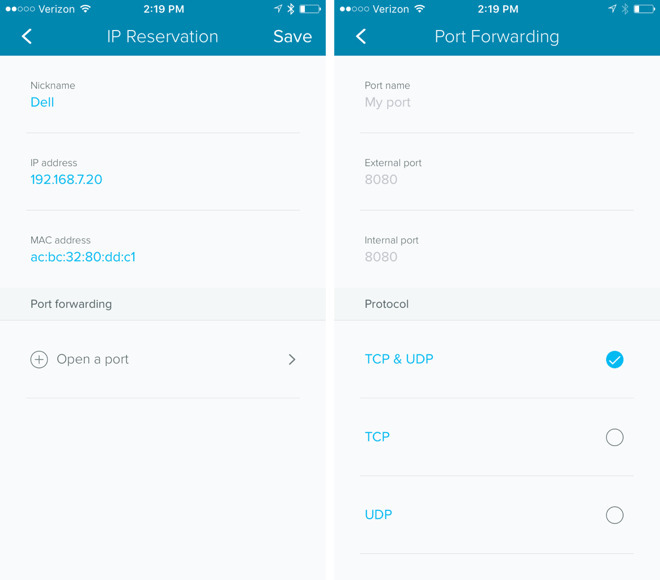 It would have been more helpful if the app could have suggested common ports by protocol name (FTP, SSH, VNC, and so on.) I suppose they must have thought if you're advanced enough to open a port, you must know what it's for. AirPort Utility in both iOS and macOS always named the ports with their common protocols, so it would have been nice to see it here, too. Is Eero a complete Airport replacement? No. 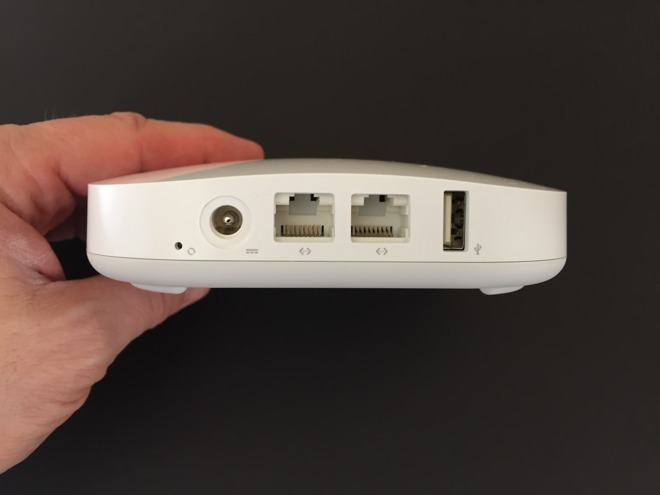 Each Eero has just two Ethernet ports on its back, and a USB port. The USB port is not actually useful for anything at this time. Eero says in its documentation that the USB is for "diagnostics." You can't connect a hard drive and use Eero for Time Machine backups over the network. You can't connect a printer and use it for Bonjour printing as you could for an Airport Express. Backups are a real concern, but for printing, many affordable modern printers work with AirPrint, and it's possible you should consider one of them. Unfortunately for our culture of consumerism, printers are more or less designed to be disposable (even though I get 8 years out of a laser printer on average) and you would probably be sensible if you updated your printer to one that is both wireless, wired, and has AirPrint in it. But, if you have Wi-Fi dead zones, don't want to go to networking school, and want an easy solution with acceptable range and speeds, Eero isn't wrong. The eero Home WiFi System is available now and comes in a variety of packages, the first being a single router for $199 from Amazon.com, two routers for $299 or a three-pack for $399.